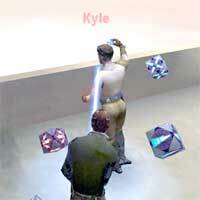 This entry was posted in Geek on January 13, 2003 by 2konbla. You are growing attached to the characters? Kinda says a whole lot doesn’t it? BTW, what map is that? I’d like to go jedi-hunting in a new environment. If you’d got a new map to recommend, fire away. Hey when you’ve spun around the ^#$*&amp;^@#$ expansive maps you’d see enough of Kyle. 🙁 This map is the first one, Bespin Streets (ffa_bespin). The screenshot was taken at the edge near the Missile Launcher. P.S. How’s your map coming along? just saying something so that you know i read your blog!